Diabetes is a disorder of metabolism, in which the body is unable to regulate its blood glucose levels appropriately. Glucose, a simple sugar, comes from the carbohydrates that you eat. Your body synthesizes and stores glucose, which it then uses as a major source of energy. For glucose to get into cells, insulin, a hormone produced in the pancreas, must be present. In people with diabetes, the pancreas either produces little or no insulin, or the body cells do not respond to the insulin that it produces. As a result, glucose can't get into the cells of the body and glucose levels in the blood become elevated. Over time, the high blood sugar levels damage many organs of the body. Certain factors can increase the risk of developing diabetes. People who have close family members with diabetes and those who are overweight have a greater chance of developing diabetes. Also, the risk of diabetes is increased in some ethnic groups including people who are African American, Latino American or Native American. Other factors that may increase the risk of diabetes include high blood pressure and hyperlipidemia (elevated cholesterol). Symptoms of high blood sugar include increased thirst and urination, blurred vision, fatigue, and weight loss. In some people, the elevated blood sugar may lead to recurrent infections such as urinary tract infection, vaginal yeast infection or skin infections. However, many people with diabetes may go for many years without symptoms. For that reason, it is recommended that all adults age 45 and older should be tested for diabetes every three years. People with diabetes are at risk for complications that may affect the eyes, kidneys, nerves and circulatory system. 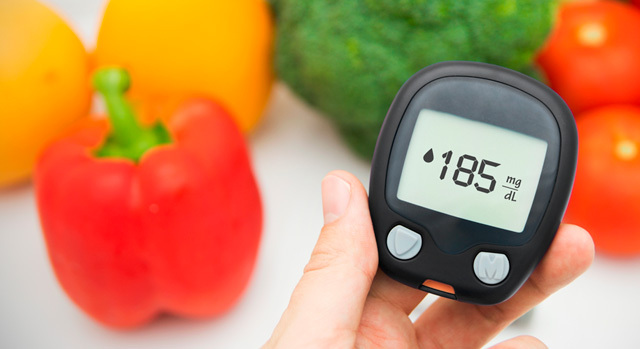 Managing diabetes requires that each patient establish therapy goals that include target blood sugar range, weight management, and dietary and lifestyle changes. A common and costly complication of diabetes, foot ulcers, can easily be prevented through self-examination and proper foot care. When left untreated, however, foot ulcers can lead to infection, gangrene and lower limb amputation. Most often the result is minor foot trauma and wound-healing failure. Diabetes-related amputation accounts for 51 percent of all amputations in the United States. Because of poor circulation and nerve damage to the feet, people with diabetes are more likely to develop infections even from a minor foot injury. For this reason, people with diabetes should treat their feet with special care. Diabetic eye disease refers to a group of eye problems that people with diabetes may face as a complication of the disease. All can cause severe vision loss or even blindness.